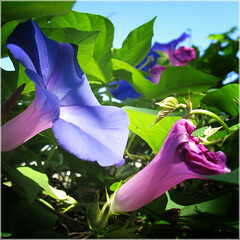 The morning glory has beautiful bell- shaped flowers along it's fast growing vines. Morning glories usually bloom in the morning. Although the plant is full of flowers from early summer until frost, each flower blooms only once. Each morning the plant is bursting with fresh new blooms, which fall off after a few hours. 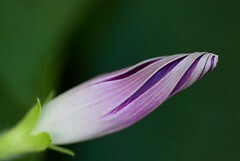 Morning glories are very aggressive plants and make great privacy screens. They look beautiful growing over a trellis or up lattice fencing. Both hummingbirds and butterflies are attracted to the morning glory flowers, which adds to the enjoyment of having them in your yard. Flower colors include white, blue, pink, purple, red and multi-colored. There are several varieties of morning glories. Some are considered annuals and some are perennials Very little care is needed to grow morning glories. Some people consider them a nuisance plant, while others enjoy watching them go through their beautiful cycle each day. 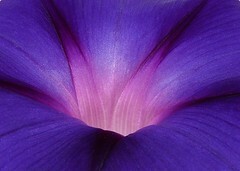 One state considers certain varieties of morning glories illegal due to their aggressive nature. 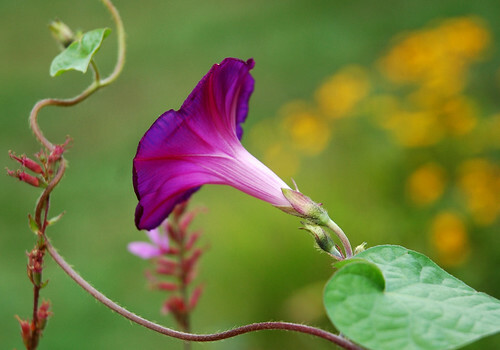 Getting rid of morning glories can be a challenge in some climates. Like any plant, it's always good to examine the pros and cons before planting. As for me, I enjoy their beauty! Morning glory photos from Flickr. Click each one to see source. 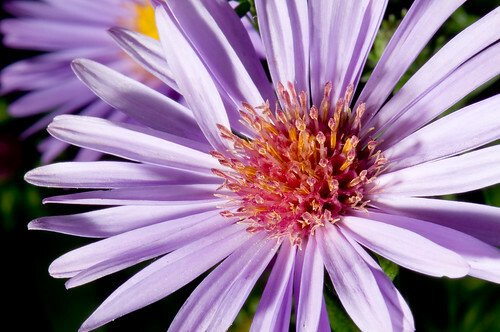 The name Aster comes from the Greek word meaning "star". What an appropriate name for this shining flower. Asters have yellow centers surrounded by multiple slender petals. Asters are usually perennial and come in a variety of colors. Colors range from various shades of purple, pink, blue, red, and white. There are several varieties of aster. Most asters bloom in the fall (there are exceptions) and are nice landscape additions as the flowers of summer begin to fade away. Asters grow best in full to partial sun with moist, well drained soil. Size depends on the variety but can range from 8 inches to 8 feet in height. Growing asters from seed can be difficult and many people bypass this step. In addition to adding color in the fall, the aster also attracts butterflies. Aster photos from Flickr. Click each one to see source. 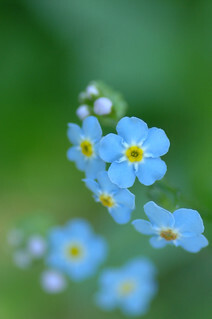 Forget-me-not is the common name for Myosotis. The name Myosotis comes from the Greek language and means "mouse ears". This is because the leaves of the myosotis appear hairy and actually shaped like little mouse ears. 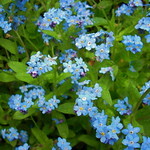 There are several varieties and colors of forget-me-nots. Colors include white, pink and blue. Their color makes them attractive to bees and butterflies. The forget-me-not blooms in spring or early summer. They are woodland plants and require rich, moist, well drained soil. They do very well in the shade but can handle the sun if conditions are right. They make great ground cover and are ideal when you need flowers that will grow under trees and shrubs. 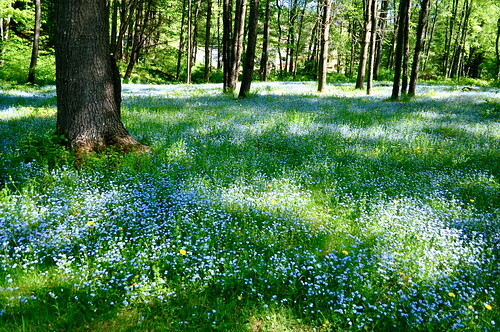 Most forget-me-nots grow to be 6 - 12 inches, but can be taller. Forget-me-nots are typically biennials, but some varieties are perennials. 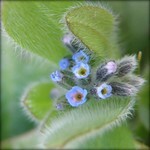 Forget-me-nots will re-seed themselves if allowed. They multiply quickly and with time can cover large areas. 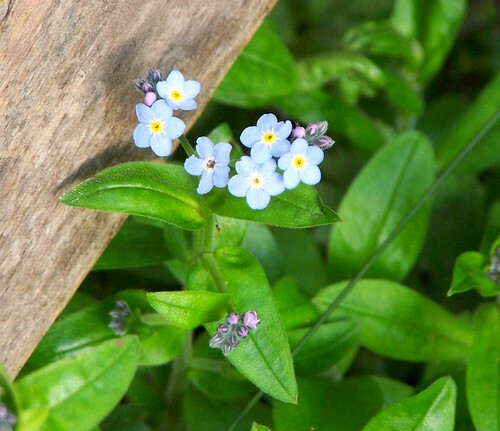 Forget-me-nots do grow in the wild and are considered to be noxious or invasive by some. Forget-me-not photos from Flickr. Click each one to see source.